Teeth whitening or bleaching can restore natural tooth colour or whiten teeth beyond even your natural colour. Dental whitening is a major trend these days, with more people than ever opting for a dazzling white smile. The Parramatta Dental Clinic team can help you find the best dental whitening regimen for you. We offer in-chair and home dental whitening procedures that will have your smile appearing brighter, smarter and sharper in no time. A thorough examination needs to be carried out to determine which option is best for you. 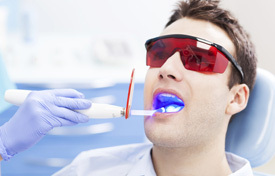 In-chair whitening uses a light-activated form of carbamide peroxide. This procedure is also referred to as power bleaching, as it uses light energy to accelerate the process of whitening in the dental chair. Most power whitenings are done in one hour over a single dental visit. Sometimes mild irritation to the gums and tooth sensitivity is experienced following tooth whitening, but these complications are usually transient. Take-home whitening kits include clear plastic trays that are specifically fitted to your teeth. You can then apply the whitening solution at home when it’s convenient for you. Take-home kits are also sometimes provided as a top to enhance and maintain the whitening result of in-chair treatment. No gap checkups are offered to new patients. Contact us today to book your time at our conveniently located practice in Parramatta Westfield!